All recipes are for 1 serving or 1 scoop of Shakeology (unless noted). Feel free to substitute any liquid ingredient for your preference (water, almond milk, coconut water, etc.). All recipes call for 1/2 cup ice (or 7ish ice cubes). Best made with a blender! 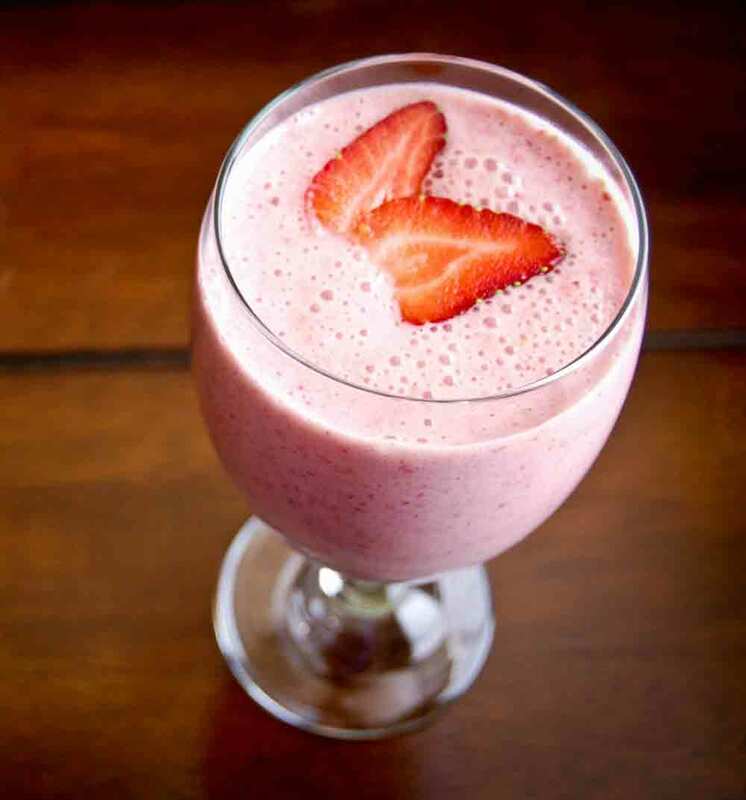 Like these Strawberry Shakeology Recipes? Checkout the Vanilla Shakeology Recipes too! Strawberry Ice Cream Recipe - Strawberry Shakeology + 6 ice cubes + 1/2 banana + 1 1/2 cups of almond or coconut milk+ 1 tablespoon of peanut butter or almond butter (I used PB2). Mix in blender, pour into bowl, and freeze for 2 hours. Frozen White Strawberry Bark - 5 tbsp. coconut oil, melted + 5 tbsp. Strawberry Shakeology, stirred until blended. Pour into tinfoil-lined pan and freeze until hard. Store in refrigerator. Berry Crunch Ice Cream - (2 servings) 1 scoop Strawberry Shakeology + 2 frozen bananas + splash almond milk + ½ tsp. vanilla extract + handful of strawberries, raspberries, blueberries + 2 tsp. goji berry seed mix + 2 cups granola. Blend and top with extra granola and berries. Nutty Strawberry No-bake Cookies - 1 cup of almond butter + 1 tsp. almond extract + 1 cup quick-cooking rolled oats + ½ cup raw honey + 1 cup Strawberry Shakeology + walnut pieces (optional). Combine almond butter, almond extract, oats, honey and Shakeology in a medium sized bowl. Mix together and roll into 24 1-inch balls. Flatten slightly on a cookie sheet and top with walnut crumbles. Refrigerate for 1 hour. No–Bake Strawberry Almond Cookies - ½ cup smooth almond butter + 2 Tbsp. unsweetened almond or coconut milk + ¼ cup quick-cooking rolled oats + 1 ½ scoops Strawberry Shakeology + ¼ cup finely chopped almonds (pulsed in a food processor). Combine almond butter, milk, oats, cranberries and Shakeology in a food processor and pulse until it forms a dough. Shape into 15 1-inch balls and flatten slightly into a cookie shape. Press each cookie into almonds on both sides. Refrigerate for 1 hour. Strawberry Pumpkin Protein Pancakes - 1 scoop of Strawberry Shakeology + ½ cup pure canned pumpkin + 2 egg whites + 1 drop Sweet Drops vanilla sweetener + 1 teaspoon cinnamon. Mix ingredients together and scoop pancake-sized dollops onto a hot griddle, flipping them over when the top begins to bubble. Strawberry Protein Squares - 2 cups old fashioned oats + 4 scoops Strawberry Shakeology + ½ cup natural almond butter + ¼ cup unsweetened almond milk. Puree oats and Shakeology in blender for 1 minute. Add almond butter and milk and blend until it forms a wet dough (1 min). Press into 8×8” dish so bottom is covered. Refrigerate for 2 hours until firm. Cut into 8 1” squares.